Militarism describes nations competing to have the largest military forces with the most advanced stockpile of weapons. 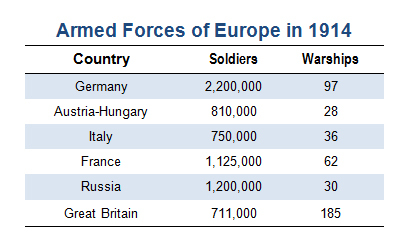 A growing imbalance of power led to an arms race between the major powers of Europe between 1870 and 1914. An arms race is a competition between two or more countries for military supremacy. 3) Blockade land troops at important points. As part of the arms race, the countries of Europe trained all their young men to create a huge number of trained reservists who could be called on, in case of war, to supplement the standing army. As one country increased its armies, so did all the others in an effort to keep the balance of power. Instead of calming tensions and preventing war, militarism resulted in nations having large numbers of fighting men and modern weapons at their disposal. Militarism led some to anticipate or expect war to break out with each minor conflict, and nations began to plan for this. The Schlieffen Plan was one such plan. In 1897, German General Count Alfred von Schlieffen was asked by Kaiser (German for Emperor) Wilhelm II to draw up plans to ensure a victory in a possible future war in which the German Reich (German for Empire) might find itself fighting on two fronts: Russia to the east and France to the west. The plan took nine years to complete. The idea was to win a two-front war by quickly defeating France before the Russians could mobilize their troops in the east. The plan scheduled 39 days for the fall of Paris, and 42 days until the entire country would surrender. First: the German ability to mobilize and move troops quickly, first to France and then towards Russia. Second: a quick attack before either country could prepare its forces and mobilize. If necessary, the plan called for German troops to march through potentially neutral territories, such as Belgium.